Mary Lou (Wright) Slater, 90, died Sunday, January 20, 2019, at Golden Living Center in Muncie. A lifelong resident of Matthews, she was born on September 16, 1928, the daughter of the late Raymond and Alice (Hazelbaker) Wright. 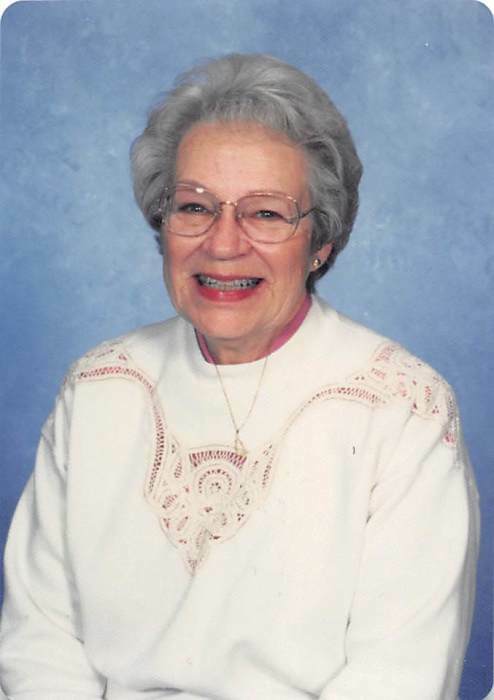 She graduated from Jefferson Township High School in 1946. She married the love of her life, Francis Paul Slater, in Noblesville, on October 12, 1946. He preceded her in death on November 1, 1983. Mary Lou worked hard all her life, working various jobs such as passing the Muncie Evening Press in the fourth grade, babysitting, the telephone office in Matthews, Matthews Feed Mill her senior year and after, the canning factory in Matthews, and she sold commodities in Muncie. She also worked for the Washington DC Paper Co., Essex Wire, and the Matthews convenience store. Mary Lou graduated from Amber Beauty and Cosmetology School in Muncie in 1962 and then was the owner and operator of Nu-Charm Beauty Nook for 15 years while raising her family. An avid sports fan, she enjoyed watching Eastbrook football and Peyton Manning when he played for the Colts. She loved spending time in her yard, taking care of her beautiful flowers. Mary Lou dedicated her life to her family, always attending the activities of her children and grandchildren. Survivors include three sons, Brad (Friend: Cindy Waggy) Slater, Muncie, Stanton "Stan" (Gayla) Slater, Upland, and Gene (Kristie) Slater, Upland; two sisters: Jackie Moorman, Muncie; and Joy "Jo" (Charlie) Clevenger, Matthews; five grandchildren, Shannon Slater, Dana Slater, Darcy Slater, Abram (Gwyn) Slater, and Lyndsey (Heath) McMillan; eight great-grandchildren, Brady Slater, Bryce and Brianna Blevins, Madyson and Mayleigh McMillan, Aedyn and Braelyn Slater, and Kadey Jones; one great-great-grandchild, Aspen Slater; her special niece, Karen Sue; and several nieces and nephews. She was preceded in death by her parents, Raymond and Alice Wright; husband, Paul Slater; son, Frankie Ray Slater; and sister, Phyllis Liming. Arrangements have been entrusted to the Jones-Smith Chapel of Armes-Hunt Funeral Home and Cremation Services, 259 North Main Street, Upland, IN 46989, where a visitation will be held on Thursday, January 24, 2019, from 4:00 - 8:00 p.m. A funeral service will be held on Friday, January 25, 2019, at 1:00 p.m. with Pastor Joe Ruberg officiating. Burial will follow at Matthews Cemetery in Matthews. Contributions in memory of Mary Lou may be made to the Matthews Public Library, P.O. Box 139, Matthews, IN 46957. Online memories and condolences may be shared at www.armeshuntfuneralhome.com.